2. Select the logical sequence of various steps followed in the Measure phase of a DMAIC project.ew question! 3. VOC- Room is too hot. If the temperature is more than 24, it will be hot and less than 18 will be too cold. Why can we not keep it at 21? What is the LSL, USL and the Target? 7. In an inspection of 200 projectors, 5 defects are found in 3 projectors and remaining projectors have no defects. What is the DPU and Zlt? 9. A dye manufactures 10mm diameter bolts. If the bolt dimensions are more than +/- 0.01mm, they do not fit. The standard deviation measured is 0.05 and the mean is 10mm. What is the Sigma Level (zlt)? 12. What is the Rolled Throughput Yield for the following process – 100 candidates apply for a job, out of which 75 clear the written test. Out of the 75, 50 clear the interview, all 50 are given the job offer. 35 candidates join. 14. 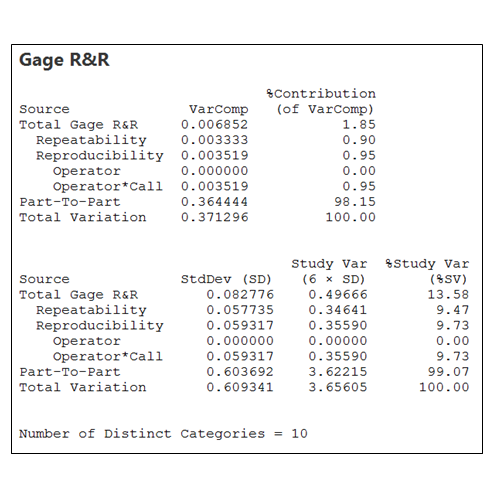 Interpret the outcome for Attribute Agreement Analysis performed on Ordinal Data Set. Assume that there is no standard score. 18. 500 projectors were inspected for 5 characteristics each. 150 defects were observed. What is the estimated short term sigma level? 28. If a weighing scale shows correct weight between the 0-30kgs range, but shows an error of 5kgs in the 30-100kg range, what kind of Gage Error is it? 33. Which of the following is not a deliverable of Measure phase?